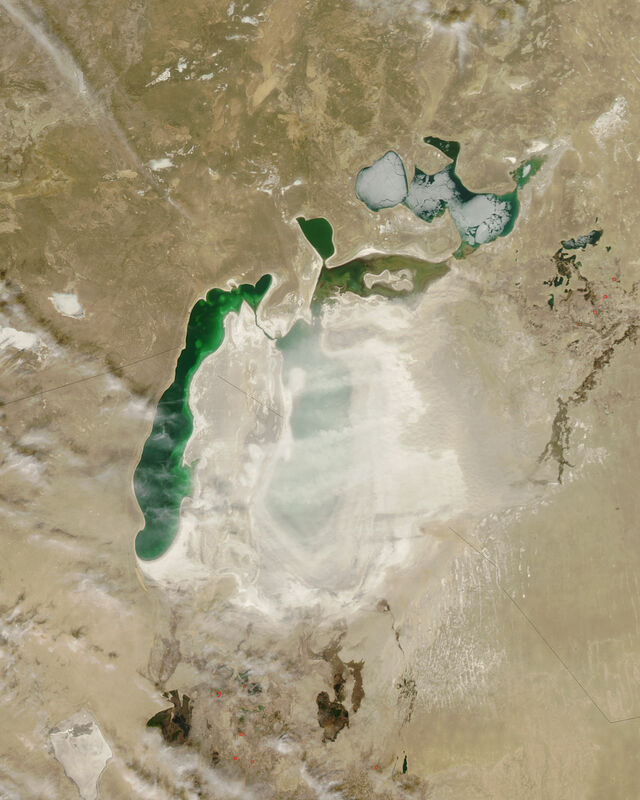 Dust plumes rose from desiccated lake beds around the South Aral Sea on April 1, 2008. The Moderate Resolution Imaging Spectroradiometer (MODIS) on NASA’s Aqua satellite took this picture the same day. In this image, the off-white storm obscures the view of the eastern part of the South Aral Sea. The light color of the dust is characteristic of lake bed sediments, which provide ample material for dust storms. The Aral Sea is not a real sea but an inland freshwater body, and it used to be the world’s fourth-largest lake. Due to river diversions, it began retreating in the 1960s, and its water level fell enough to split it in two: the North Aral Sea and the South Aral Sea. 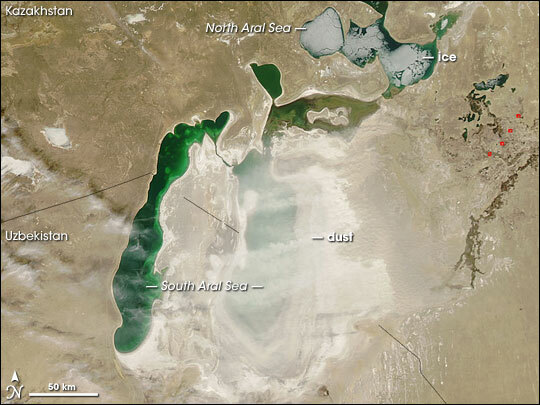 Thanks to conservation efforts, the North Aral Sea had rebounded by the spring of 2007. The South Aral Sea, however, continued to decline. Dry lake bed sediments blown aloft in this image appear to originate primarily from the land surrounding the South Aral Sea. By the late 1990s—prior to serious conservation efforts—the health hazards posed by declining lake levels and the resulting dust had earned the attention of health researchers. They noted rising rates of serious infectious diseases and infant mortality in the region. Increased dust storms were cited as one reason for a decline in human health.